CONTINUOUS TECTONIC EVOLUTION OF THE ORAVA BASIN (NORTHERN CARPATHIANS) FROM LATE BADENIAN TO THE PRESENT-DAY? 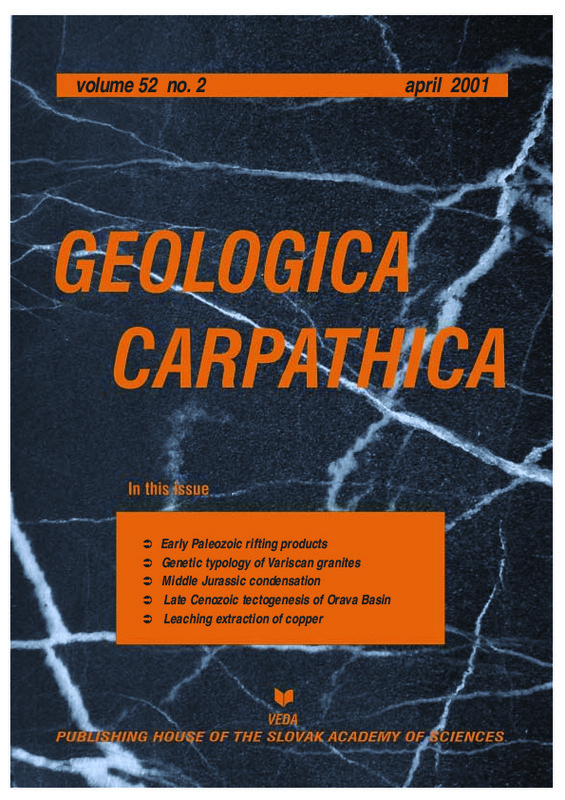 Abstract: Most of the Male Karpaty Mts, which form a geographical connecting link between the Eastern Alps and Western Carpathians, consists of an Early Paleozoic low-grade metamorphic complex intruded by Lower Carboniferous granitoid plutons. Metamorphic recrystallization connected with granite emplacement led to the formation of a crystalline complex metamorphosed under greenschist to amphibolite facies conditions. Major and trace element contents of metabasalts and clastic metasedimentary rocks have been studied in this crystalline complex. Distribution of relatively immobile trace elements (REE, HFSE) was unaffected by metamorphism and reflects original magmatic or sedimentary compositions. Two geochemical types of metabasalts have been indentified in relation to their geological position: (1) metabasalts occurring in association with metagabbros, metadolerites and small amounts of black shales and metacherts are of N-MORB type and (2) small metabasalt bodies in clastic metasedimentary rocks with sporadic carbonates are close to E-MORB/OIT or CT in composition. The clastic sedimentary rocks are represented by alternating metapsammitic rocks with variable admixture of pelitic component and organic matter together with a smaller amount of metapelitic rocks and black shales. Relatively uniform major and trace element distribution in the clastic metasedimentary rocks indicates uniformity of the composition and source area of protolith. The protolith of the metasedimentary rocks were close to greywackes from the ensialic back-arc basin depositional setting, with a source comprising mostly a mixture of acid and intermediate magmatic rocks in the upper continental crust. A new lithostratigraphical division of the Early Paleozoic complex of the Male Karpaty Mts is proposed. We define here two groups: (1) the Pernek Group — a metamorphosed incomplete (dismembered) ophiolite sequence representing a relic of the upper part of the oceanic crust Pre-Lower Carboniferous in age and (2) the Pezinok Group composed of clastic metasedimentary rocks with a small amount of metacarbonates and metabasalts with E-MORB/OIT or CT signature Silurian-Devonian in age which represents a part of the rift basin fill probably inboard of an ensialic island arc. Both groups came into contact during strong shortening and nappe formation processes in the Pre-Early Carboniferous (Upper Devonian?) time. Abstract: The geochemistry of 166 new whole-rock analyses from West-Carpathian Variscan granitic rocks are presented on the basis of their division into four principal groups: S-, I-, A- and specialized S-type (SS). The contribution shows some discrimination diagrams which are useful for the recognition of these principal granite groups and also give a possible outline of the geodynamic scenario of their origin. All studied groups belong to mainly crustal aluminic (SS-, S-type) and aluminocafemic (I-, A-, partly S-type) associations, mantle-derived cafemic dioritic rocks are rare. Generally, the S- and I-type groups show predominantly Na2O/K2O ratio > 1, whereas A- and SS-type granites usually exhibit Na2O/K2O < 1. I-types are more Si-poor and Fe, P-rich than other groups, however, a part of the SS-type group belongs to the P-rich evolved granites (>0.2 wt. % P2O5) and the A-types are generally very poor in P. The Zr vs. SiO2 diagram clearly discriminates Zr and Si-rich hypersolvus A-type from other groups, similarly the A-types show the highest Zr/Hf-ratio and Y contents (>20 ppm). Ba-Sr and Sr-Rb diagrams successfully divide plagioclase-rich I-type from S,A-type and especially from K,Na-feldspar-rich SS-type. The newly modified Rb-Ba-Sr diagram reliably discriminates the groups: poorly (I, S), mildly (S, A, rarely I) and strongly evolved granites (SS, rarely S and A) were recognized. REE rock/chondrite normalized diagram discriminate all groups: REE-rich I-type without Eu-anomaly, from REE-rich A-type with negative Eu-anomaly and REE-poor S- and especially SS-type with pronounced negative Eu-anomaly. In this sense of the geotectonic position, the S- and I-type can be considered as orogenic granites, in contrast, the A-type and SS type granites are post-orogenic members. Abstract: Condensed Middle Jurassic deposits (Dunajec Group), outcropping in the High-Tatric tectonic units of the Tatra Mountains, were subjected to intensive pressure dissolution resulting in great thickness reduction. Crinoidal limestones of the Smolegowa Formation (Bajocian) lost about 20 % of their thickness. The Krupianka Formation (Bathonian) occurs in three lithofacies, differing in the intensity of pressure-solution phenomena. Chemical compaction of the Krupianka crinoidal limestones equalled >30 %, of stylonodular limestones — ~50 %, and of ferruginous limestones even — ~70 %. It differed in various tectonic units, probably due to different tectonic history. The ferruginous and stylonodular limestones owe their modern development to pressure-solution processes. The ferruginous limestones are highly enriched in elements resistant to dissolution. The stylonodular structure formed by selective dissolution of nodular limestones. Pre-compactional differences between the Krupianka Formation lithofacies were less evident than they are today. Abstract: The fault-bounded Orava Basin is situated on the boundary between the Inner and Outer Carpathians, close to the northern boundary of the Klippen Belt. The Orava Basin was formed during the Neogene times and was enlarged in its NE part during the Quaternary. According to the author’s hypothesis, the crucial role has been played by a master transversal strike-slip fault named Prosiek-Domanski Wierch-Lepietnica fault. The Orava Basin was opened by extension between the so-called Orava block rotated to the NW and the Tatra block shifted to the NE. According to palynological data it started 14–15 Ma and was probably synchronous with thrusting of the Magura Nappe and also with the uplift of the Tatra massif. Quaternary subsidence of the NE part of the present-day bottom of the Orava depression indicates, that probably the same tectonic mechanism is active now. Such an assumption is based on multidisciplinary studies: present-day activity of earthquakes (11 September 1995), geomorphological analysis of the Quaternary terraces aiming at the reconstruction of vertical tectonic movements, and on geophysical soundings. Some attempts aiming at understanding the role of paleostress field were made. The idea of a shift of tectonic process of subsidence and also of vertical uplift from the west to the east is supported by inferences derived from the thermal evolution of the western part of the Orava Basin. Abstract: Chrysocolla has been characterized by XRD, FTIR, DTA-TG, TEM and EPMA in order to clarify properties of this phase and to identify a suitable routine identification method. Chrysocolla is X-ray amorphous, although in some cases slightly sensitive to EG-treatment. IR spectra indicate a trioctahedral layer-silicate structure, resembling in many features that of trioctahedral smectites. HRTEM images do not show a phyllosilicate-like repetitive layering in accordance with XRD results. The SiO2/CuO ratio is considered responsible for the degree of crystal ordering achieved. SiO2/CuO ratio near 1 results in an amorphous phase, while SiO2/CuO near 1.3 generates more smectite-like characteristics. For routine analyses in mining operations, DTA-TG is considered feasible, once basic mineralization types are known at a site.